You just feel better in the summer. A team of researchers from Cambridge University, funded by the Wellcome Trust and JDRF, a type 1 diabetes research foundation, studied more than 1000 samples from subjects from the U.S., the U.K., Iceland, Germany, Australia, and Gambia. They found that more than one-fifth of the subjects' genes showed seasonal variability. In particular, they found that the gene ARNTL reached its peak expression during the summer months. During the summer, it inhibited inflammation and then was itself suppressed during the winter, allowing the body's immune system to fire up and produce inflammation. Inflammation underlays a host of ills that are prevalent in the winter months. Those illnesses can range in severity from the cold that makes the rounds in your household (twice) to cardiovascular, psychiatric, and autoimmune diseases. 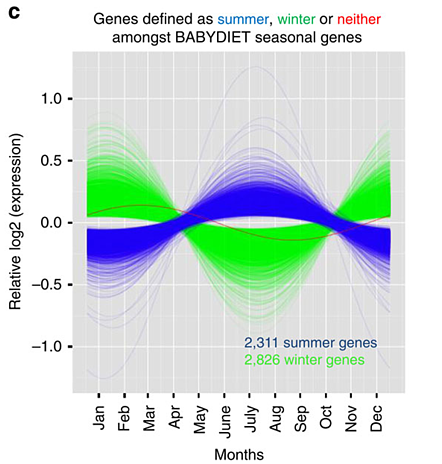 Interestingly, they found that genes responded specifically to the seasons, regardless of geography. 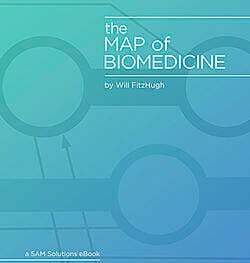 So, while we in the Northern Hemisphere enjoy healthier summer days in June, July, and August, our friends in the Southern Hemisphere find themselves more prone to illness during those months, which are their winter months. Six months later, in December, January and February, we in the Northern Hemisphere fight colds and flus, while Australians are at peak vitality. The researchers postulated that since the immune system ramps up during the winter months, winter might be the ideal time to administer vaccines. In Gambia, a tiny country in West Africa that is surrounded by Senegal except for a narrow coastline, there isn't a winter to speak of, but Gambians' genes still behaved seasonally. Specifically, ARNTL's expression shut down during the rainy season, a time when infectious diseases like malaria are more prevalent. This shift allows Gambians' immune systems to ramp up their inflammatory responses to protect people from illness. Iceland was the only country in the study that didn't follow the seasonal pattern. The researchers suspect that this might have something to do with its far-northern latitude: "[t]his could be due to the near-24-hour daylight during summer if seasonal human physiology is regulated by changes in the annual photoperiod." A new area of research? More interesting, still, is that no one had made the genetic connection before. According to the study's authors, it is well known that doctors diagnose more type 1 diabetes, cardiovascular, psychiatric, and other disorders rooted in inflammation during the winter than in the summer, but that's as far as it went. Knowing -- and more studies will surely follow -- that seasonality is a factor in our health could be another piece in the personalized medicine puzzle. You can imagine a day when a prescription will include not only a dosage tailored to a patient's genome, but also to the time of year that the patient is taking the drug.